New Haven, CT, May 12, 2011, Nancy Schumacher, Author and Artist of Carlisle’s Classics, has been recognized by Elite American Artists for dedication, achievements and leadership in fiction. Since she was diagnosed with epilepsy in 1940, Ms. Schumacher has felt compelled to educate society about it and other hidden diseases, such as Parkinson’s disease and depression. She became inspired to write following a comment from a university professor who said she could not teach on the subject. Not one to become discouraged, Ms. Schumacher collaborated with Dr. F.J.L. Blasingame of the American Medical Association on several medical articles. Since 1985, she has presented 24 medical papers in Europe and China. In addition, she has written fiction books on the subject, including “The Swallow’s Flight,” “Surviving the Spider’s Net,” and “Unraveling the Spider’s Net,” her latest book; she also created the artwork for their covers. Pursuing a Ph.D. in health psychology, Ms. Schumacher holds a master’s degree in psychology as well as a Bachelor of Fine Arts and a Bachelor of Arts in education. She has previous experience as an art teacher for day care organizations and Montessori schools. Nancy Schumacher was originally selected for inclusion in EliteAMERICAN Artists in may 2011. 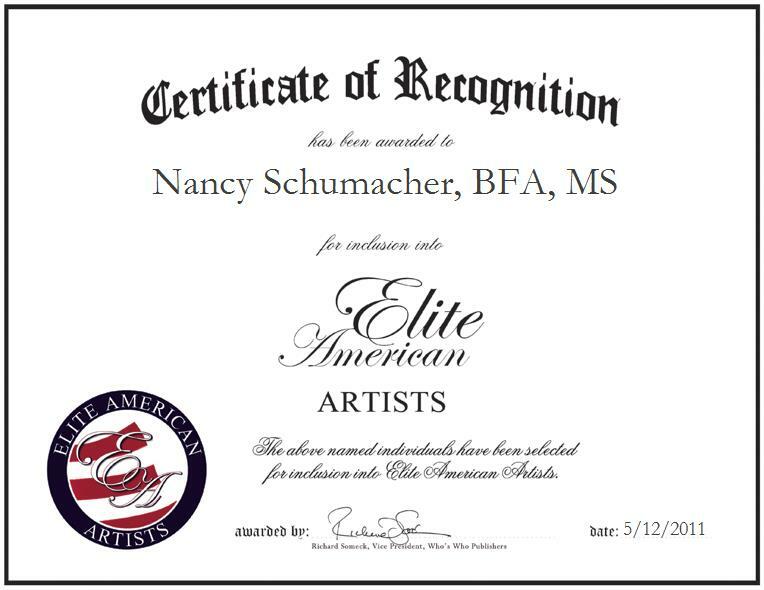 We are proud to be featuring Ms. Schumacher again in EliteAMERICAN Artists for 2015.